Eyedea and Abilities: the early days before First Born, E&A, and By the Throat. Welcome to the wonderful world of Sixth Sense. This is the product of Eyedea and Abilities as young teens, the prelude to First Born which gives a glimpse into how they came to be. 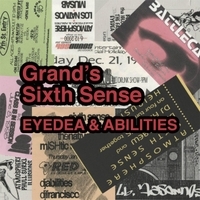 As young teenagers who were exploring the world of music and playing with their new toy: a four track, they made this on a cassette tape for Mikey's grandparents, calling it "Grand's Sixth Sense." It has been taken from the tape by Nick Mellstrom and cleaned up/mastered at Winterland Studios by Brian Johnson. Nick has been a friend of Mikey's since childhood and Brian has worked with Mikey on everything from Eyedea and Abilities, to Carbon Carousel, to Face Candy. Thank you very much for all your help.